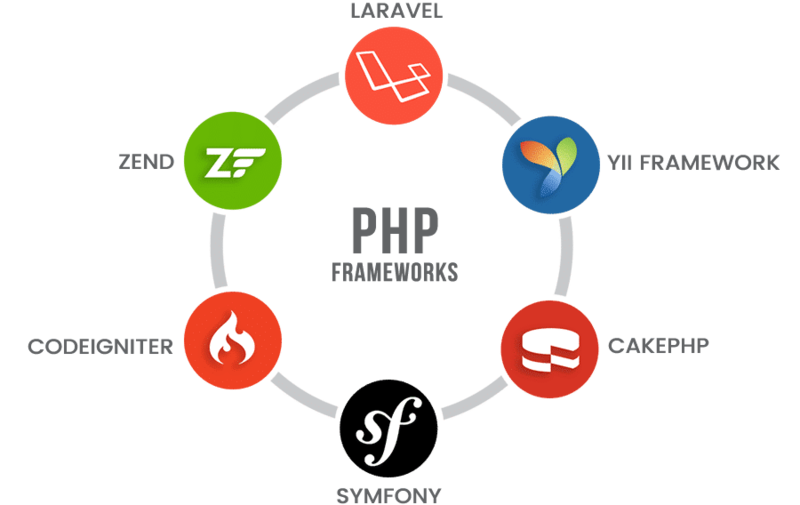 A ​PHP​ ​Framework​ ​is​ ​a​ ​universal,​ ​reusable​ ​software​ ​platform​ ​to​ ​help​ ​web​ ​developers​ ​create agile​ ​software​ ​applications,​ ​products,​ ​and​ ​solutions.​ ​A​ ​framework​ ​is​ ​a​ ​piece​ ​of​ ​software​ ​that provides​ ​web​ ​developers​ ​with​ ​the​ ​code​ ​base​ ​and​ ​consistent​ ​standardized​ ​ways​ ​of​ ​creating​ ​web applications.​ ​As​ ​a​ ​leading​ ​Laravel,​ ​Yii,​ ​and​ ​​CakePHP​ ​web​ ​development​ ​company​,​ ​NetConnect Digital​ ​Agency​ ​offers​ ​some​ ​of​ ​the​ ​best​ ​PHP​ ​framework​ ​designs​ ​and​ ​development​ ​solutions​ ​to meet​ ​your​ ​needs​ ​and​ ​requirements. Why​ ​Use​ ​Framework​ ​in​ ​PHP? PHP​ ​is​ ​a​ ​server-side​ ​scripting​ ​language​ ​for​ ​web​ ​development,​ ​and​ ​almost​ ​every​ ​content management​ ​system​ ​(CMS)​ ​uses​ ​this​ ​as​ ​a​ ​base​ ​programming​ ​language.​ ​By​ ​taking​ ​advantage of​ ​a​ ​PHP​ ​framework,​ ​you​ ​can​ ​organize​ ​codes​ ​and​ ​files​ ​for​ ​a​ ​speedy​ ​load.​ ​When​ ​you​ ​set​ ​up​ ​a PHP​ ​framework,​ ​it​ ​already​ ​has​ ​a​ ​built-in​ ​folder​ ​structure,​ ​and​ ​most​ ​of​ ​the​ ​framework​ ​uses​ ​the Model-View-Controller​ ​(MVC)​ ​design​ ​for​ ​managing​ ​the​ ​code.​ ​The​ ​MVC​ ​pattern​ ​separates​ ​the business​ ​logic​ ​and​ ​the​ ​presentation​ ​layer​ ​of​ ​a​ ​website,​ ​making​ ​its​ ​architecture​ ​consistent​ ​and easy​ ​to​ ​maintain.​ ​Following​ ​these​ ​standards​ ​will​ ​allow​ ​web​ ​developers​ ​to​ ​keep​ ​codes​ ​and​ ​files clean​ ​and​ ​organized. PHP​ ​framework​ ​not​ ​only​ ​delivers​ ​well-organized,​ ​reusable,​ ​and​ ​maintainable​ ​code,​ ​but​ ​it​ ​also makes​ ​web​ ​development​ ​faster​ ​and​ ​more​ ​efficient.​ ​There​ ​are​ ​many​ ​web-based​ ​applications​ ​that have​ ​been​ ​developed​ ​and​ ​created​ ​using​ ​the​ ​PHP​ ​framework.​ ​Using​ ​the​ ​MVC​ ​enables​ ​web developers​ ​the​ ​parallel​ ​approach​ ​in​ ​development.​ ​This​ ​only​ ​means​ ​that​ ​one​ ​developer​ ​can​ ​work on​ ​the​ ​view​ ​(the​ ​front-end​ ​of​ ​an​ ​application)​ ​while​ ​the​ ​others​ ​can​ ​work​ ​on​ ​the​ ​logic​ ​(the back-end)​ ​in​ ​a​ ​seamless​ ​and​ ​efficient​ ​manner.​ ​By​ ​having​ ​the​ ​ability​ ​to​ ​be​ ​designed​ ​and developed​ ​by​ ​more​ ​than​ ​one​ ​programmer​ ​at​ ​a​ ​time,​ ​the​ ​MVC​ ​method​ ​makes​ ​building​ ​an application​ ​faster​ ​and​ ​more​ ​efficient​ ​when​ ​compared​ ​to​ ​other​ ​methods. PHP​ ​frameworks​ ​are​ ​great​ ​at​ ​securing​ ​web-based​ ​applications​ ​against​ ​common​ ​security threats.​ ​You​ ​can​ ​easily​ ​find​ ​a​ ​variety​ ​of​ ​input​ ​and​ ​output​ ​filtering​ ​functions​ ​in​ ​PHP​ ​to​ ​help​ ​protect your​ ​website​ ​from​ ​certain​ ​attacks.​ ​Among​ ​the​ ​best​ ​PHP​ ​frameworks​ ​commonly​ ​used​ ​by developers​ ​to​ ​create​ ​robust​ ​and​ ​secure​ ​web-based​ ​applications​ ​include​ ​Yii​ ​(a​ ​robust​ ​and​ ​mature PHP​ ​framework),​ ​Zend​ ​(one​ ​of​ ​the​ ​most​ ​popular​ ​PHP​ ​frameworks),​ ​CakePHP​ ​(one​ ​of​ ​the​ ​oldest PHP​ ​frameworks),​ ​Symfony​ ​(a​ ​modern,​ ​high-performing​ ​PHP​ ​framework),​ ​Laravel​ ​(​ ​a​ ​widely used,​ ​clean,​ ​and​ ​elegant​ ​PHP​ ​framework),​ ​and​ ​Phalcon​ ​(a​ ​full​ ​stack​ ​PHP​ ​framework). PHP​ ​application​ ​maintenance​ ​and​ ​support​ ​are​ ​essential​ ​activities​ ​to​ ​keep​ ​web-based applications​ ​built​ ​using​ ​this​ ​framework​ ​safe,​ ​secure,​ ​and​ ​well-functioning.​ ​As​ ​a​ ​result,​ ​your business​ ​can​ ​improve​ ​the​ ​process​ ​speed,​ ​reduce​ ​errors,​ ​expand​ ​customer​ ​reach,​ ​increase flexibility​ ​and​ ​scalability,​ ​and​ ​more.​ ​At​ ​NetConnect​ ​Agency,​ ​our​ ​highly​ ​skilled​ ​web​ ​developers provide​ ​reliable​ ​and​ ​affordable​ ​PHP​ ​maintenance​ ​and​ ​support​ ​services​ ​including​ ​making technical​ ​enhancements,​ ​allowing​ ​new​ ​add-ons​ ​to​ ​the​ ​system,​ ​reviewing​ ​the​ ​code​ ​at​ ​regular intervals,​ ​bug​ ​fixing,​ ​and​ ​more. Developed​ ​during​ ​the​ ​1970s,​ ​the​ ​Model-View-Controller​ ​(MVC)​ ​is​ ​a​ ​software​ ​architecture​ ​pattern built​ ​to​ ​keep​ ​the​ ​presentation​ ​of​ ​the​ ​data​ ​separate​ ​from​ ​the​ ​methods​ ​that​ ​interact​ ​with​ ​the​ ​data. A​ ​well-created​ ​MVC​ ​system​ ​allows​ ​the​ ​back-end​ ​developer​ ​and​ ​the​ ​front-end​ ​developer​ ​to​ ​work on​ ​the​ ​same​ ​system​ ​simultaneously​ ​without​ ​sharing​ ​or​ ​editing​ ​the​ ​files​ ​that​ ​the​ ​other​ ​party​ ​is working​ ​on.​ ​Through​ ​this​ ​kind​ ​of​ ​separation,​ ​web​ ​developers​ ​can​ ​make​ ​the​ ​code​ ​cleaner, extensible,​ ​and​ ​maintainable.​ ​Popular​ ​PHP​ ​frameworks​ ​such​ ​as​ ​CodeIgniter,​ ​CakePHP,​ ​Zend, and​ ​Symfony​ ​follow​ ​the​ ​MVC​ ​design​ ​pattern. A​ ​framework​ ​is​ ​a​ ​user-written,​ ​custom​ ​code​ ​within​ ​a​ ​predefined​ ​set​ ​of​ ​rules,​ ​which​ ​allows developers​ ​to​ ​create​ ​modules​ ​and​ ​applications​ ​using​ ​core​ ​library​ ​functions​ ​and​ ​with​ ​PHP​ ​as​ ​the basic​ ​programming​ ​language.​ ​Using​ ​the​ ​PHP​ ​frameworks,​ ​web​ ​developers​ ​can​ ​create​ ​and develop​ ​a​ ​more​ ​customized​ ​website​ ​as​ ​well​ ​as​ ​maintain​ ​exceptional​ ​coding​ ​standard​ ​in​ ​a seamless​ ​and​ ​efficient​ ​manner.​ ​At​ ​NetConnect,​ ​our​ ​Yii,​ ​Laravel,​ ​and​ ​​CakePHP​ ​development experts​ ​have​ ​in-depth​ ​knowledge​ ​and​ ​skills​ ​to​ ​enforce​ ​good​ ​coding​ ​standards​ ​using​ ​the​ ​PHP framework. PHP​ ​is​ ​one​ ​of​ ​the​ ​most​ ​widely​ ​used​ ​programming​ ​languages​ ​in​ ​the​ ​world.​ ​PHP​ ​frameworks provide​ ​a​ ​number​ ​of​ ​tools​ ​and​ ​libraries​ ​to​ ​help​ ​web​ ​developers​ ​built​ ​safe,​ ​secure,​ ​and well-functioning​ ​web-based​ ​applications.​ ​All​ ​top​ ​PHP​ ​frameworks​ ​contain​ ​certain​ ​Libraries​ ​and Helpers​ ​that​ ​can​ ​assist​ ​developers​ ​with​ ​SOAP/REST​ ​API,​ ​caching​ ​mechanism,​ ​form​ ​validation, data​ ​handling​ ​with​ ​JSON,​ ​input​ ​and​ ​output​ ​filtering,​ ​database​ ​abstraction,​ ​session​ ​and​ ​cookie handling,​ ​emails,​ ​calendars,​ ​pagination,​ ​and​ ​more.​ ​​ ​All​ ​of​ ​these​ ​utilities​ ​and​ ​libraries​ ​can​ ​help​ ​a web​ ​developer’s​ ​job​ ​become​ ​easier​ ​and​ ​more​ ​efficient. To​ ​prevent​ ​certain​ ​attacks,​ ​web​ ​developers​ ​need​ ​to​ ​follow​ ​the​ ​best​ ​web​ ​development​ ​practices to​ ​build​ ​a​ ​secure​ ​and​ ​foolproof​ ​application.​ ​When​ ​it​ ​comes​ ​to​ ​application​ ​security,​ ​web developers​ ​need​ ​to​ ​guard​ ​the​ ​system​ ​against​ ​Cross​ ​Site​ ​Scripting​ ​(XSS)​ ​and​ ​Cross​ ​Site Request​ ​Forgery​ ​(CSRF)​ ​attacks,​ ​prevent​ ​SQL​ ​injection​ ​attacks,​ ​protect​ ​the​ ​file​ ​systems​ ​and session​ ​data,​ ​and​ ​handle​ ​errors​ ​properly.​ ​With​ ​a​ ​PHP​ ​framework,​ ​most​ ​of​ ​the​ ​aforementioned approaches​ ​to​ ​enhance​ ​the​ ​code​ ​security​ ​can​ ​be​ ​done​ ​automatically.​ ​Additionally,​ ​when developing​ ​web​ ​applications​ ​using​ ​the​ ​PHP​ ​framework,​ ​make​ ​sure​ ​to​ ​secure​ ​your​ ​app​ ​against bad​ ​input.​ ​By​ ​validating​ ​and​ ​filtering​ ​the​ ​incoming​ ​data,​ ​you​ ​can​ ​build​ ​a​ ​safe​ ​and​ ​secure web-based​ ​application. PHP​ ​is​ ​one​ ​of​ ​the​ ​most​ ​versatile​ ​and​ ​powerful​ ​web​ ​development​ ​scripting​ ​languages​ ​to​ ​build dynamic​ ​and​ ​interactive​ ​web​ ​applications.​ ​By​ ​leveraging​ ​PHP​ ​framework​ ​tools,​ ​you​ ​can​ ​easily gain​ ​performance​ ​benefits​ ​by​ ​taking​ ​advantage​ ​of​ ​utility​ ​modules​ ​that​ ​are​ ​created​ ​to​ ​maintain modular​ ​applications.​ ​By​ ​creating​ ​files​ ​and​ ​default​ ​content​ ​automatically,​ ​web​ ​developers​ ​can gain​ ​per​ ​code​ ​generation​ ​and​ ​make​ ​their​ ​jobs​ ​easier​ ​and​ ​more​ ​efficient.​ ​All​ ​PHP​ ​frameworks come​ ​with​ ​helpful​ ​tools​ ​that​ ​allow​ ​web​ ​developers​ ​to​ ​do​ ​caching,​ ​profiling,​ ​benchmarking,​ ​and more.​ ​Additionally,​ ​modern​ ​frameworks​ ​are​ ​great​ ​for​ ​dynamic​ ​loading​ ​as​ ​these​ ​can​ ​load​ ​code only​ ​when​ ​necessary​ ​or​ ​whenever​ ​they​ ​are​ ​needed. Frameworks​ ​enable​ ​web​ ​developers​ ​to​ ​build​ ​a​ ​faster​ ​and​ ​more​ ​optimized​ ​application​ ​without any​ ​hassle.​ ​PHP​ ​frameworks​ ​offer​ ​the​ ​best​ ​way​ ​to​ ​access​ ​databases​ ​in​ ​an​ ​easy,​ ​seamless,​ ​and object-oriented​ ​manner.​ ​Instead​ ​of​ ​directly​ ​interacting​ ​with​ ​the​ ​database​ ​through​ ​Structured Query​ ​Language​ ​(SQL)​ ​queries,​ ​web​ ​developers​ ​can​ ​use​ ​an​ ​Object-Relational​ ​Mapping​ ​(ORM) model​ ​to​ ​manage​ ​the​ ​structure​ ​and​ ​relationships​ ​between​ ​data.​ ​In​ ​this​ ​way,​ ​web​ ​developers​ ​can efficiently​ ​map​ ​the​ ​database​ ​table​ ​to​ ​a​ ​PHP​ ​class​ ​and​ ​a​ ​row​ ​from​ ​the​ ​table​ ​can​ ​be​ ​seamlessly mapped​ ​to​ ​an​ ​instance​ ​of​ ​the​ ​class. NetConnect has extensive experience in developing some of the following PHP frameworks. NetConnect​ ​Digital​ ​Agency​ ​delivers​ ​top​ ​quality​ ​PHP​ ​design​ ​services​ ​and​ ​development​ ​solutions, including​ ​​Laravel​ ​development​ ​services,​​ ​​CakePHP​ ​development​ ​services​,​ ​and​ ​​Yii​ ​framework development​ ​services​.​ ​Our​ ​dedicated​ ​and​ ​highly​ ​experienced​ ​team​ ​of​ ​web​ ​developers​ ​provide affordable​ ​PHP​ ​development​ ​solutions​ ​and​ ​framework​ ​design​ ​services​ ​to​ ​help​ ​you​ ​build innovative​ ​web-based​ ​applications. Yii​ ​is​ ​a​ ​high​ ​performance​ ​PHP​ ​framework​ ​that​ ​delivers​ ​powerful​ ​caching​ ​support​ ​and​ ​specifically designed​ ​to​ ​work​ ​efficiently​ ​with​ ​AJAX.​ ​With​ ​Yii,​ ​web​ ​developers​ ​can​ ​easily​ ​create​ ​ingenious Web​ ​2.0​ ​applications​ ​using​ ​high-performance​ ​facilities​ ​offered​ ​​ ​by​ ​the​ ​framework.​ ​As​ ​a​ ​​premier Yii​ ​framework​ ​development​ ​company​,​ ​our​ ​experts​ ​can​ ​help​ ​you​ ​create​ ​clutter-free​ ​and​ ​reusable codes,​ ​thereby​ ​ensuring​ ​a​ ​clear​ ​separation​ ​of​ ​the​ ​presentation​ ​and​ ​logic​ ​layers. Laravel​ ​is​ ​a​ ​clean,​ ​beautiful,​ ​and​ ​expressive​ ​framework​ ​for​ ​web​ ​artisans​ ​who​ ​value​ ​readability, simplicity,​ ​and​ ​elegance.​ ​This​ ​type​ ​of​ ​PHP​ ​web​ ​development​ ​framework​ ​is​ ​suited​ ​for​ ​all​ ​types and/or​ ​sizes​ ​of​ ​projects,​ ​from​ ​robust​ ​and​ ​large​ ​applications​ ​to​ ​simple​ ​JSON​ ​APIs.​ ​As​ ​a​ ​trusted Laravel​ ​development​ ​company​,​ ​we​ ​can​ ​provide​ ​you​ ​with​ ​the​ ​benefits​ ​of​ ​Laravel​ ​PHP​ ​framework from​ ​consulting​ ​to​ ​implementation​ ​and​ ​integration. CakePHP​ ​is​ ​an​ ​easy​ ​to​ ​use​ ​framework​ ​that​ ​enables​ ​web​ ​developers​ ​to​ ​create​ ​efficient​ ​web applications​ ​more​ ​seamlessly.​ ​Based​ ​on​ ​the​ ​MVC​ ​architecture,​ ​CakePHP​ ​handles​ ​every​ ​aspect of​ ​your​ ​application,​ ​from​ ​the​ ​user’s​ ​initial​ ​request​ ​to​ ​the​ ​final​ ​rendering​ ​of​ ​a​ ​web​ ​page.​ ​As​ ​a reliable​ ​​CakePHP​ ​development​ ​company​,​ ​we​ ​can​ ​help​ ​you​ ​develop​ ​and​ ​deploy​ ​efficient​ ​and scalable​ ​web​ ​applications​ ​using​ ​the​ ​CakePHP​ ​framework.